The KNV-MM-14B (PVS-15 Style) Dual Mini-Monocular system can be separated for use individually or assembled with a unique bridge mechanism to create a very powerful binocular. Designed for submersion to a depth of 20 meters, this is one lightweight, ruggedized dual-tube night vision goggle system! 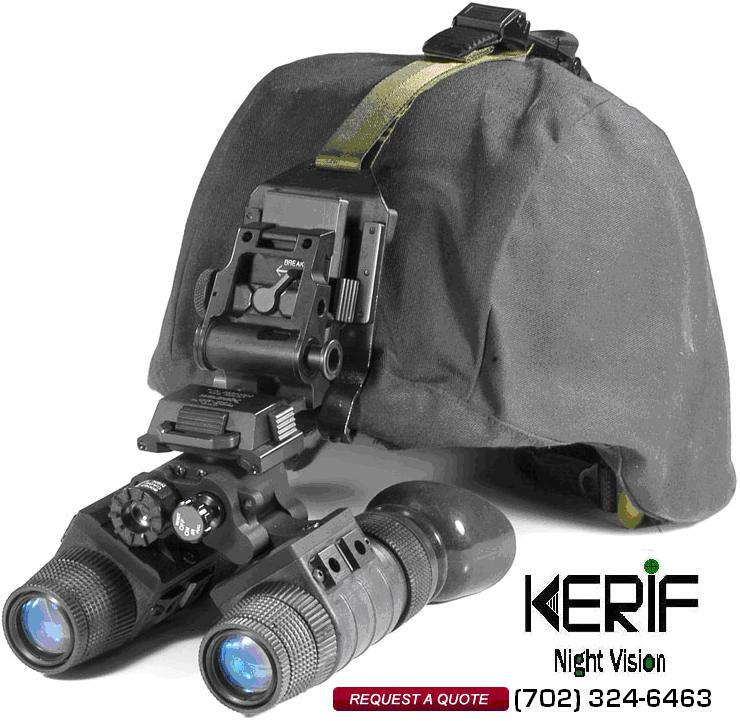 It features 2 self-contained single battery power Mini-Monoculars and can be weapons mounted, hand held, head mounted or helmet mounted for hands-free tactical operations. The advantage of the dual-tube design provides increased depth perception to the user for land, sea, or airborne operations. Battery usage for each MM-14 Mini-Monocular can be either a (1) AA 1.5V or CR123 3V Lithium battery, depending on your preference (a AA Battery adapter is provided to give you the choice). .
Where long range surveillance is necessary, you can add (2) 3X magnifier press-on lenses, and now you have a 3X Binocular system with enhanced capability and performance. Rugged Design - The system has been designed to be submersible to 20m, withstand salt fog, high humidity, high altitude, cold weather, shock, and high temperatures. The unit also uses a shoe style head/helmet mount interface design that makes for a more “stable” mount platform. Two LED indicators in the eyepieces give the user low battery and IR on indications for increased awareness. High Performance - Using High quality optics that are coated to enhance night time operations the NVBS-15 can out perform all other systems on the market. 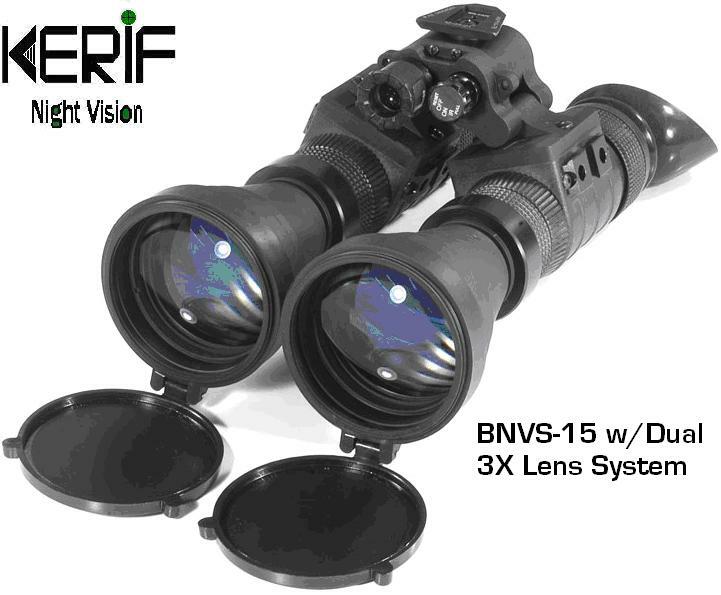 Add high performance Gen III "Pinnacle" tubes and you have the ultimate Dual Tube Night Vision Binocular. 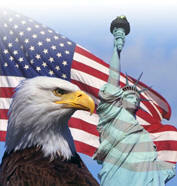 An affordable Dual-Tube Binocular designed for Military, Homeland Security, Police and Security Professionals. Offers true Stereoscopic views for increased Depth Perception. Used specifically where navigation at night is necessary. The Model M953 is based on the military DoD nomenclature AN/PVS-15 used by U.S. special forces. This rugged lightweight, self-contained twin tube goggle systems offers better depth perception than single tube systems, and provides the same performance characteristics as found in aviator systems. The M953 can be operated as a hand-held binocular, or helmet mounted. The M953 was designed specifically where critical mission performance and depth perception factors are required elements.